So if you’re starting late, and need some ideas for this year’s Advent calendar, hopefully this roundup will inspire you to create your own for this year, or use this season to create one for next year! This is so adorable! Plus, you can customize them to use whatever colors you want, and put in any kind of treat or card! 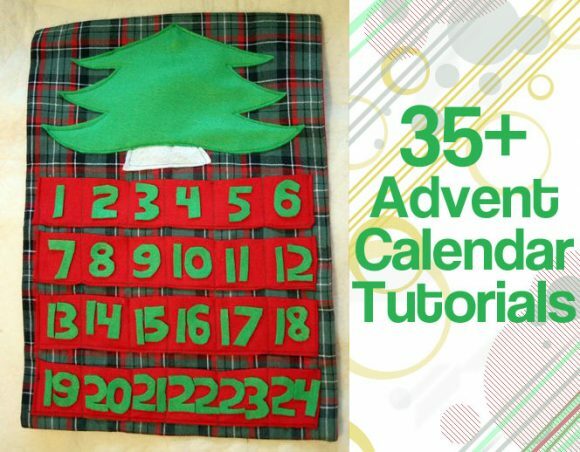 The pattern is available so you can make this cute advent calendar too. Rebecca Cooper from simple as that shares a great snowflake activity advent calendar. A great way to upcycle matchboxes or other small boxes into an Advent calendar. Instead of putting treats or prizes inside they do a special activity together as a family each day. 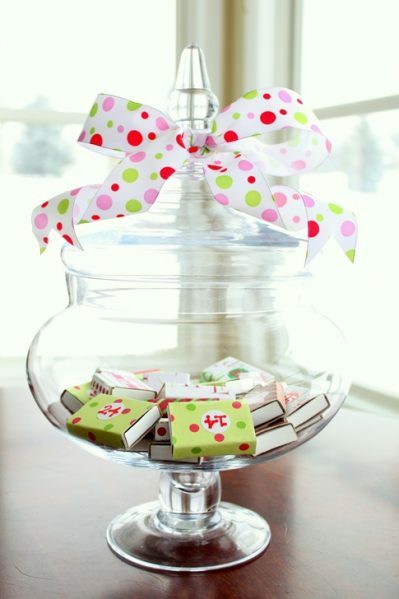 You get to open a little tiny present each day – how fun! Another great use for those little tins. Jessie from Friendly Badger creates a calendar you can put on your fridge! Juliann Law of PB J&J shares a fun printable puzzle for kids to create. 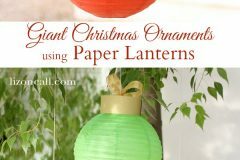 I love that despite a few craft glitches, this turns out to be a great project that can be reused every year! The boxes start with the numbers showing, then when the treat is taken out, you turn them around to show a cute picture. Includes three different printables you can use to start your own Advent Calendar. Labels and stickers are provided for you to make your own version of this cool spool calendar. This is a great way for kids (and adults) to rediscover their favorite Christmas books each year. 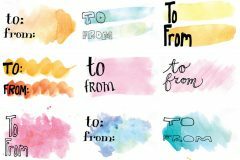 These dry erase countdowns can be used for many occasions. It’s always fun to add little notes into your kids’ lunch bag and this incorporates the little note and the advent calendar. 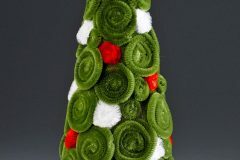 The beauty of this design is that it rolls up and stores easily to be used year after year. Another great use for that shoe organizer hanging on your door! 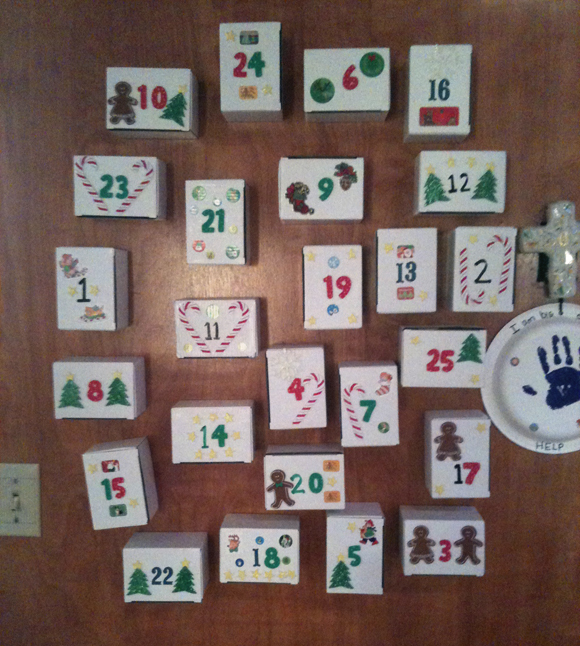 Marie used leftover boxes from work to create this cute advent calendar for her little girls. Angela K didn’t just make an Advent Calendar, she had each day’s card correspond to part of a story book! Katie G. made a few of these to use throughout the season – one to hold holiday cards, and one to use as an advent calendar with little foam Christmas trees. In addition to the 9 featured ideas, they include links to two more! This includes a dollar store advent calendar. 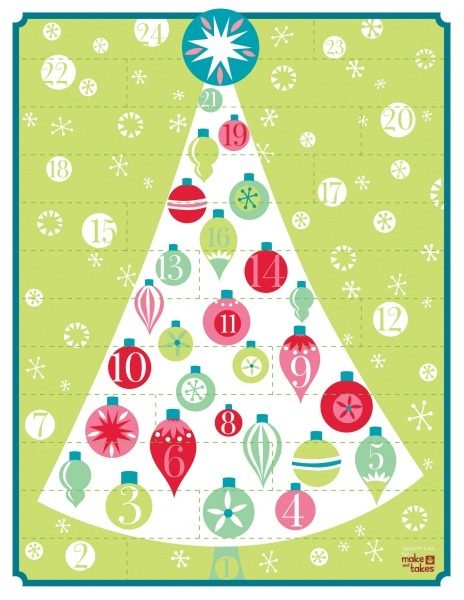 Jen shares 24 great religious and secular advent calendar ideas. 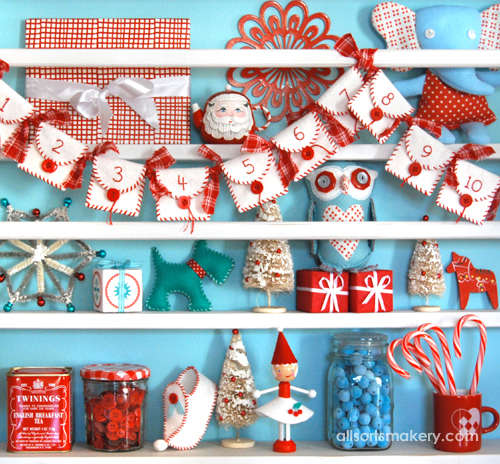 Jen shares 20 more advent calendar ideas. I love the toilet paper tube calendar idea – way to upcycle! I *love* the simplicity of the gum advent calendar! Not enough inspiration for you? 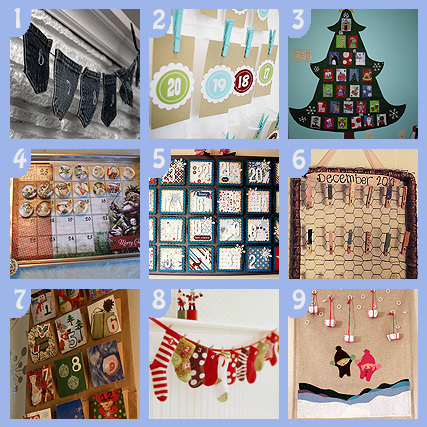 Check out the “Creative Advent Calendars” Flickr Group and my Advent Calendar Pinterest board for more ideas! I am a graphic/web designer living in Florida with my husband and dog. 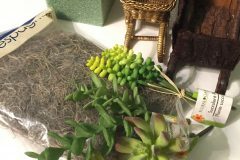 I have always loved to craft and shop at dollar stores, so I am excited to be able to combine both for this blog! Wow, awesome list of advents! 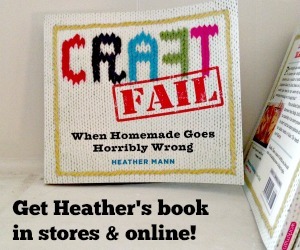 so many amazing ideas – i may have to make one for each kid ot have their own.